Cost Management Services has been working with employers for over 18 years to save money by taking advantage of the CMS Work Opportunity Tax Credit Program. Based on CMS’ experience 15% of the workforce is eligible for the employment tax credits. Why aren’t you taking advantage? Click here to calculate your potential savings! Call CMS today at 1-860-678-4401. CMS will identify eligible employees. CMS understands all the Federal and State guidelines for your company to obtain the eligible tax credits. CMS handles all the administrative duties necessary to obtain WOTC in your state. 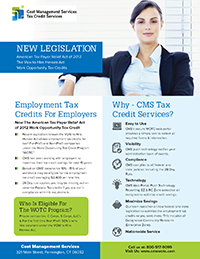 CMS protects your organization from asking the sensitive questions necessary to obtain the WOTC tax credits. Who Is Eligible For The WOTC Program? WOTC applies to new employees hired on or after May 1, 2007, and before December 31, 2011. Follow our blog for news on expected updates to this program in 2012.